In considering this award, it seems indeed fitting that the first recipient is Joe Anderson. Joe and Clayton had a deep respect for each other, which was particularly apparent at conferences and during Executive Committee meetings. 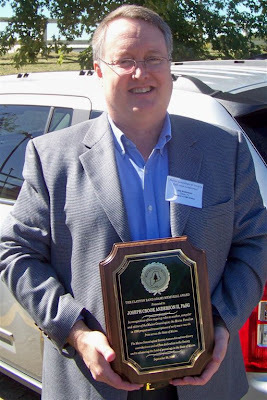 As for credentials, Joe is a Certified Genealogist and a Fellow of the American Society of Genealogists – a true honor as there are only 50 lifetime members. Election to that society is based on a candidate’s published genealogical scholarship. Joe serves as editor of The American Genealogist, joining that publication in 1999. Where MGS is concerned, the names Joe Anderson and Maine Genealogical Society are synonymous. The list of Joe’s contributions to MGS are lengthy. Joe serves as editor of the Society’s scholarly journal, The Maine Genealogist. Beginning as a co-editor in February 1991 when the journal transitioned from The Maine Seine to its current format, Joe became its editor with Lois Thurston in February 1994, and has been its sole editor since August 1998. As chair of the Publications Committee, Joe also oversees all of the special publications projects. He has transcribed early town records. He has been instrumental in the success of the Maine Families in 1790 series. He joined that project in 1992 as Associate Editor of Volume 3, working with the projects founder Ruth Gray. He was Co-Editor with Lois Thurston of Volume 4, and has been the series sole editor from Volume 5 on. He oversees all the special publications projects -reviewing, editing and working closely with the authors of all the Maine Families in 1790 sketches that are submitted for publication. We are also fortunate that we can occasionally entice Joe to leave his home in Texas to come up to Maine to give lectures. But probably the most significant contribution that Joe makes to the society is the inspiration and encouragement he gives to fellow researchers. He knows how to gently push trying to bring out the best analysis and research. I know that whenever I’ve encountered a problem, I can rely on being able to bounce it off Joe. I would also like to mention that all of the contribution that Joe provides to MGS he does out of his love of the state and his generosity. His efforts for the Society are non-compensated and purely voluntary. And he does all of this in addition to his full-time job and family time – and I know that he is very devoted to his family. Aside from his genealogical achievements I have to say that I always look forward to catching up with Joe at a conference. Joe can be summed up as being just an all-around nice guy. Joe Anderson is pretty much the heart and soul of MGS. from across the State of Maine. and to advancing the field of genealogy in the State of Maine.